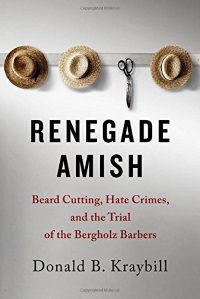 Donald Kraybill’s new book Renegade Amish: Beard Cutting, Hate Crimes, and the Trial of the Bergholz Barbers tells the story of the beard-cutting attacks of 2011 and the subsequent investigation, trial and aftermath. Kraybill spent six months helping federal prosecutors with their case against the Bergholz group, and served as an expert witness for the trial. Renegade Amish is based on trial transcripts, interviews of key subjects including victims, Sam Mullet’s relatives, and former Bergholz members. Today we have a 3-book giveaway of Renegade Amish and Q-and-A with the author. Part two of this post and our context winners will come next week. Johns Hopkins is giving away three copies of Renegade Amish to Amish America readers. To enter to win a copy, just leave a comment or question on this post. For an extra entry, share this contest on Facebook, Twitter, other social media, or on your own site or blog. Then just email me (at amishamerica@gmail.com) letting know you did. We’ll announce the winners here next Monday, September 15. Have beard cutting attacks happened before in Amish history? Donald Kraybill: This is a precedent. I’m not aware of any forcible beard cuttings in 325 years of Amish history. It’s the most bizarre thing I’ve come across in researching and writing on the Amish of North America over the last 35 years. In the spring of 2012 the US Department of Justice asked me to assist them in the prosecution. I helped them to understand Amish beliefs and practices. I served as an expert witness for five hours during the three-week federal trial in September 2012. It was a legal maze, with five attacks, nine victims, 16 defendants (including four married couples), 90 separate verdicts, and 20 attorneys. I devote a chapter in the book to the trial. For several reasons. This was such a benchmark case in Amish history. I wanted to understand it better and also document it for historical purposes. I also aimed to gather together all the pieces of this puzzle—scattered by the media over two years—into one coherent narrative. I was also curious about the background of the Bergholz Amish which executed the attacks. Who were they? How were they transformed from a peace-loving group into a violent one? Were they in fact, really Amish? How did you answer that question in the book? The Bergholz clan engaged in some two dozen aberrations of Amish life: They rejected a Christian identity, terminated Sunday worship services, rejected Amish values of nonviolence and forgiveness, condoned physical punishment of adults, placed deviants in animal pens dubbed “Amish jails,” made death threats to law enforcement officers, and committed various sexual improprieties. In my judgment they are not Amish, at least not according to any conventional standard of Orthodox Amish belief and practice. Of course there are no laws that prevent any group– regardless of what they believe—from claiming the Amish brand. How do other Amish people view the Bergholz clan? Why did the federal Department of Justice become involved in what might appear as a petty Amish quarrel? There were nine victims, 16 offenders, and five different attacks in various counties. It would have been extremely difficult to undertake multiple prosecutions in different counties for a host of reasons which I explain in the book. Because the attacks could be considered hate crimes and because they involved interstate commerce the federal government prosecuted the offenders under the 2009 Shepard-Byrd Hate Crimes Act. The jury agreed and convicted the 16 defendants with some 87 different criminal counts. The defendants appealed their convictions to the United States Sixth District Circuit Appellate Court in Cincinnati. In the spring of 2014 the national Anti-Defamation League pulled together a coalition of 40 different groups vigilant about civil rights abuses. These groups filed a friend of the court brief urging the appellate court to uphold support the convictions. The coalition of these groups view the Bergholz convictions of federal hate crimes as a benchmark case that is significant for other Americans who might be attacked because of their religion, sexual orientation, race, gender, nationality or disability. What is the most important takeaway of the book? The sad irony is that some former pacifist “Amish” have been the first Americans to be charged with hate crimes under the Matthew Shepard Hate Crimes Act. Nonetheless these convictions have underscored the long-standing American tradition that citizens are free to practice their religious faith without fear of being attacked by those who may deplore their religion. With the appellate court reversal of the hate crime convictions about 10 days ago, what does that mean for this case? I will explain that in Part Two in the next post. Trying to decide if I want to go to hear Donald next Friday at Berlin. Sign me on for the giveaway if not too late. I would of courses discover this site the day after the give away. Great web site! I wish I had found it when I used to live in Indiana! Sorry you missed it Sherry! Stay tuned for more giveaways though. I recommend subscribing for email updates so you’ll know when they happen. We’ll be having another one in the next few weeks. Another giveaway in 3 weeks, you say, Erik? All right! Hope springs eternal. Welcome, Sherry, from one Hoosier to another!